Tulsi Gabbard, the first Hindu-American elected to Congress, has fired back at critics who accuse the presidential hopeful of being a “Hindu nationalist,” describing the claim as slander that fuels religious bigotry in politics. The four-term Democratic congresswoman has been in the media’s crosshairs since announcing her presidential bid earlier this month, with political pundits taking issue with her vocal anti-war positions, as well as her decision to meet with Syrian President Bashar Assad and India’s Prime Minister Narendra Modi. She’s also been accused of being associated with, and accepting money from, Hindu nationalist groups such as the Rashtriya Swayamsevak Sangh (RSS) and the Bharatiya Janata Party (BJP). Such characterizations, the presidential candidate wrote in an op-ed, are manifestations of religious bigotry that have haunted American politics for decades. “Some media outlets have chosen to craft a false narrative of intrigue by profiling and targeting all of my donors who have names of Hindu origin and accusing them of being ‘Hindu nationalists,’” Gabbard wrote. She drew parallels to John F. Kennedy, whose own presidential bid was hampered by accusations that his Catholic upbringing would make him more loyal to the Pope than the US Constitution. Her thoughts on the sensitive issue appear to have resonated with many on social media. “This is a good issue to tackle. Thank you president Tulsi. #Tulsi2020,” one Twitter user wrote. “You’re right, even though I think religion is absurd. I realize that I have to fight for the rights of people with whom I do not agree with. These people test the strengths of the freedom that protect all of of us. If we do not defend their rights, than we endanger our own,” another netizen commented. Curiously, her most fervent critics come from within her own party. 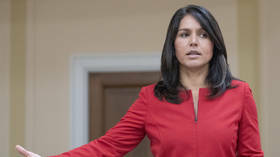 Former Democratic National Committee Chairman Howard Dean told CNN earlier this month that Gabbard was the only Democratic candidate unfit to be president. Left-leaning media outlets in particular have shown little sympathy for Gabbard, with many harking on her alleged links to Hindu nationalism, as well anti-LGBTQ statements she made before joining Congress. Gabbard has apologized for the remarks and says that she is now a firm supporter of gay rights.